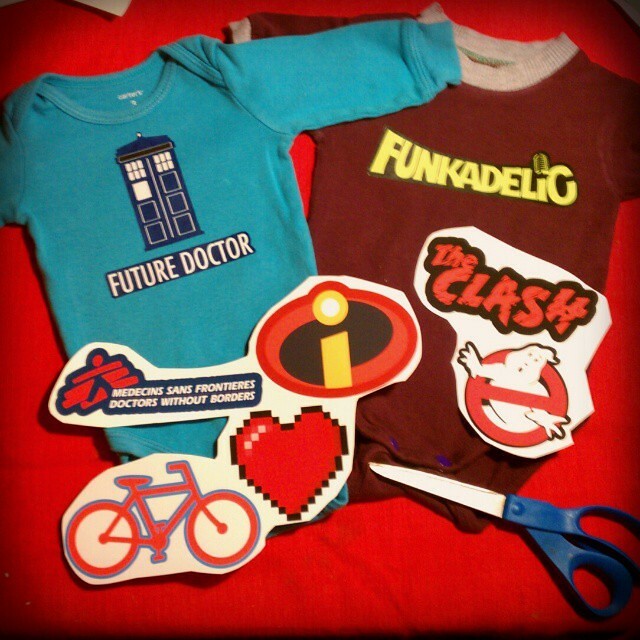 Not sewing and not knitting, but I've been having fun embellishing some boring blank onesies and T-shirts with nerdy iron-on T-shirt transfers. These are the Avery dark fabric ink-jet transfers, as traditional iron-on ink-jet T-shirt transfers only work on white or very light-colored garments. A Funkadelic onesie for baby, ironed on to a purple and gray New Conceptions One-Hour Bodyshirt that I sewed for Z when I was pregnant with her. This was husband's request—I also made him a matching Funkadelic T-shirt that I couldn't find for the photograph. 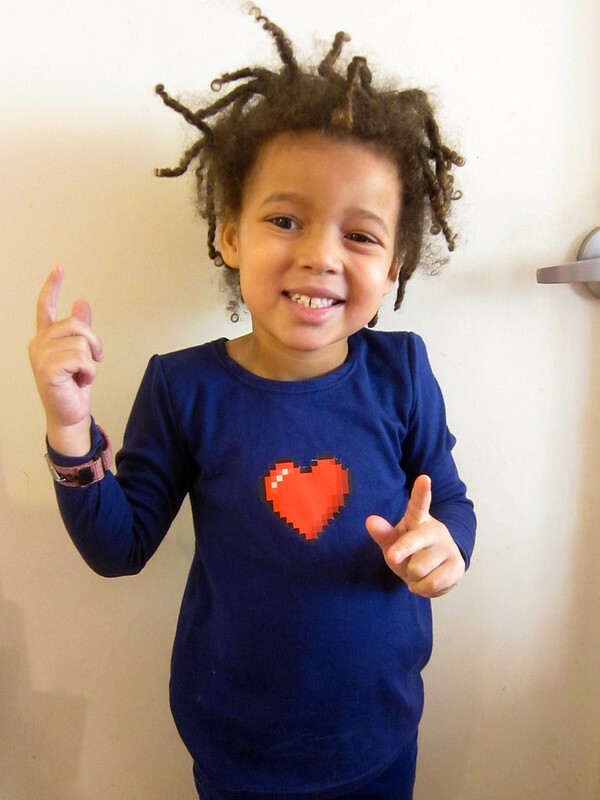 A Minecraft-style pixel heart T-shirt for Ms. Z, ironed onto a knit T-shirt sewn for her by my mom (no pattern—my mom just takes some measurements and improvises her own patterns). This was my gamer husband's idea—they both LOVE Minecraft and play it together quite a bit. Since each transfer sheet is a bit pricey, I didn't want to leave any white space, so I also squeezed in a bunch of other vector logos or icons that I haven't ironed on to anything yet: The Incredibles, Ghostbusters, The Clash, a bicycle, and Doctors Without Borders/Médecins Sans Frontières (MSF). The results were pretty good, and they seem to be holding up after a few test washings. I had originally wanted to do freezer-paper stencils (I have SO much fabric paint that I've never used) because the effect is a little cooler... but they are a lot more work and I cannot for the life of me seem to apply the right thickness to prevent unseemly cracking on knit fabric. Anyway, it's a fun way to do some quick embellishments without the time required for embroidery, appliqué or stenciling. The ironing only takes two minutes each. A few tips, though: first, be careful to read the instructions for your transfers thoroughly. For light-colored T-shirt transfers, you generally need to reverse the artwork—not so with the dark ones. I wasted two sheets before I figured this out. What are your favorite embellishment techniques? Appliqué or embroidery are still tops for me, but these transfers are just so QUICK and EASY. Husband says it is a gamer thing! Z loves it. Ahhhh Funkadelic! I need one of these! I also now need a pixellated heart... who knew? 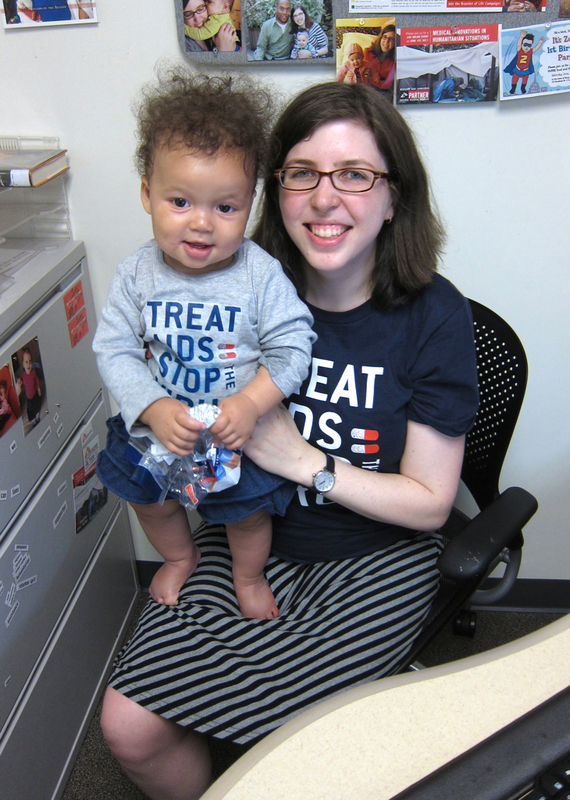 It's so fun to see the picture of baby Z and see how much she's grown! Frankly, I slice off stuff from Tshirts and sew it onto other tshirts. 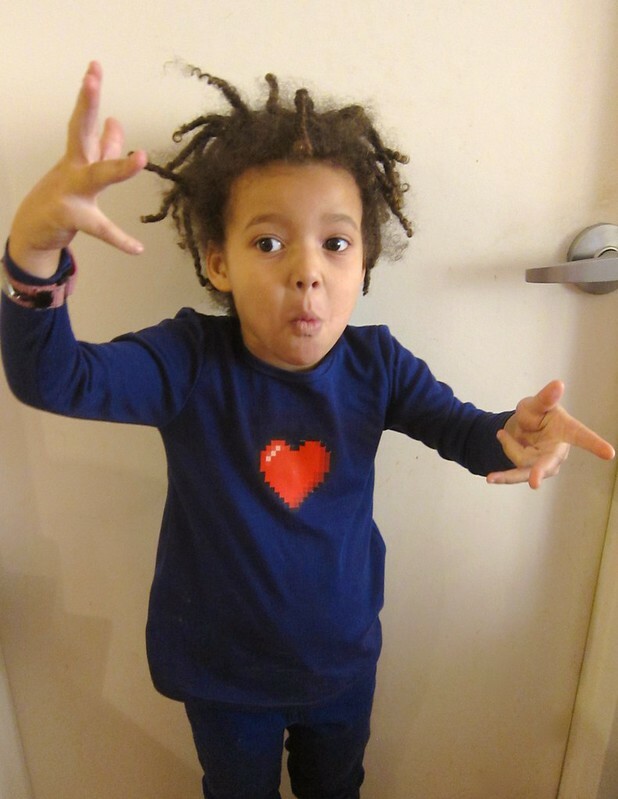 I have enough almost shredded shirts with stuff on them (bands, cartoons, weird graphics) that I outfitted my sons for years. The iron on stuff is better in that sewing onto onesies is tricky. I wish I had kept all my old punk rock and other T-shirts from when I was in my teens—I did a ruthless purge a while back and photographed them, but didn't keep any of the actual items. Husband also had a real Funkadelic shirt but it fell to pieces from wear. 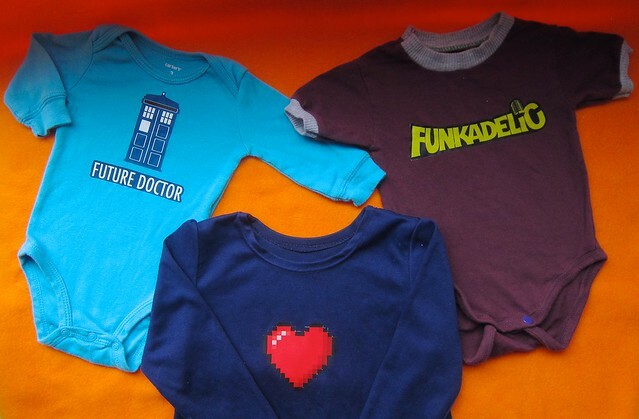 YES TO ALL THE NERDALICIOUS ONESIES!! !